Our first experience with Norwegian Cruise Lines (NCL) occurred in Hawaii on the Norwegian Wind. Though the Wind is no longer in NCL’s fleet, it was there that we learned about NCL’s brand of “Freestyle Cruising”. Our next NCL cruise checked off one of my bucket list travel destinations, the Panama Canal. In the Spring and Fall, a small number of ships transition from Alaska cruising to Caribbean cruising or the reverse via the Panama Canal. 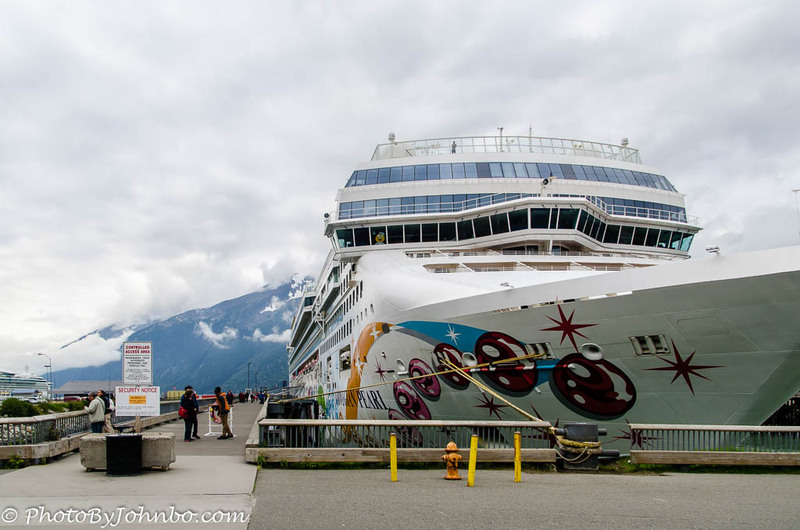 It was our good fortune to find ourselves for two weeks on the Norwegian Pearl, one of the largest cruise ships that can fit through the canal’s lock system. Our spring transition cruise started at Miami and, if one has 28 days to spare, can disembark in Alaska. You can read about our Panama Canal crossing here, and more about the Norwegian Pearl here. You can read about our cruise excursions by clicking on the “Cruising” category in the list on the right margin of this page. Our 14-day itinerary ended at Los Angeles. Before we departed the ship, however, we took advantage of an NCL program that allowed us a discounted incidentals bill by putting down a deposit on our next cruise, destination and timing to be determined later. That time and destination came in August of last year. We decided on Alaska, convinced my sister, my nephew and their guests to accompany us. 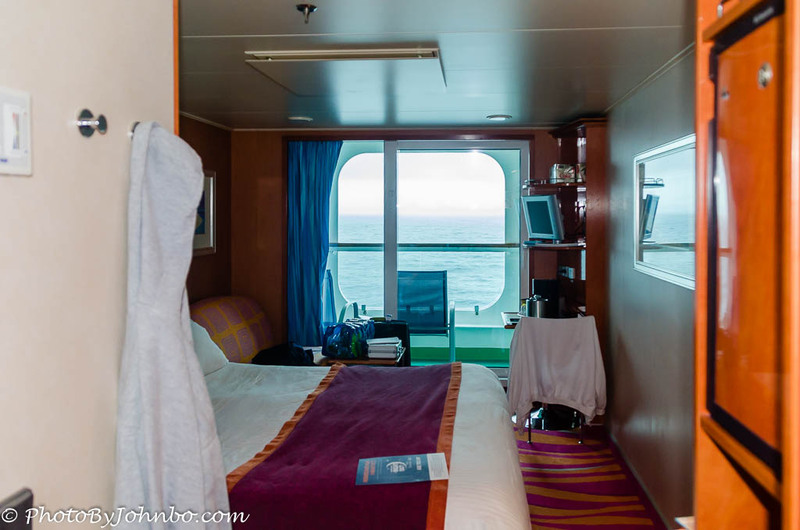 Normally, we’ve chosen the basic outside cabin, usually with an obstructed view to save a few dollars on the cruise fare. As a special treat, we decided to select a balcony room. 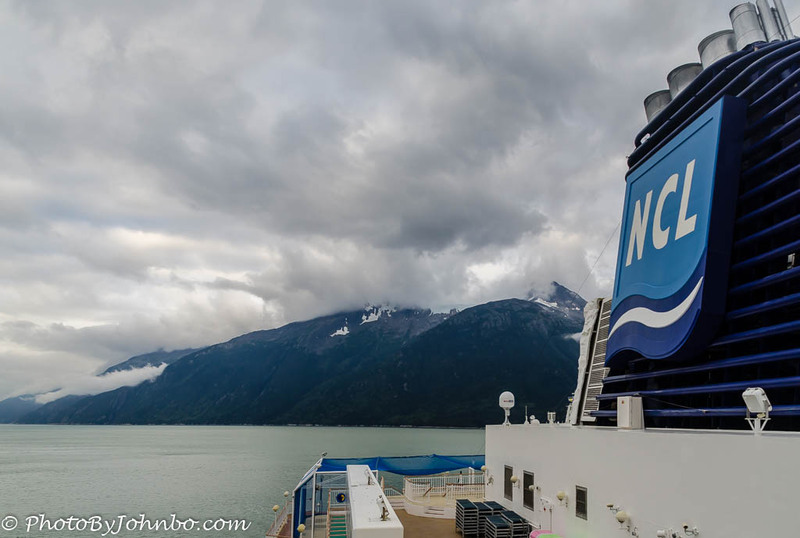 We appreciated the extra space, and it was nice to have the balcony view when we were in Glacier Bay. We made a mental note, however, that the balcony is much more enjoyable in a warmer climate. August in Alaska isn’t exactly the tropics. Even discounting the balcony, this class of room includes a small couch that can accommodate a third person for sleeping, a much more comfortable situation than three in a standard outside cabin. Note the hoodies hanging in our room. In Alaska, these were the minimum required covering for wandering around on deck. On this trip, we discovered passengers have access to a bridge viewing area. 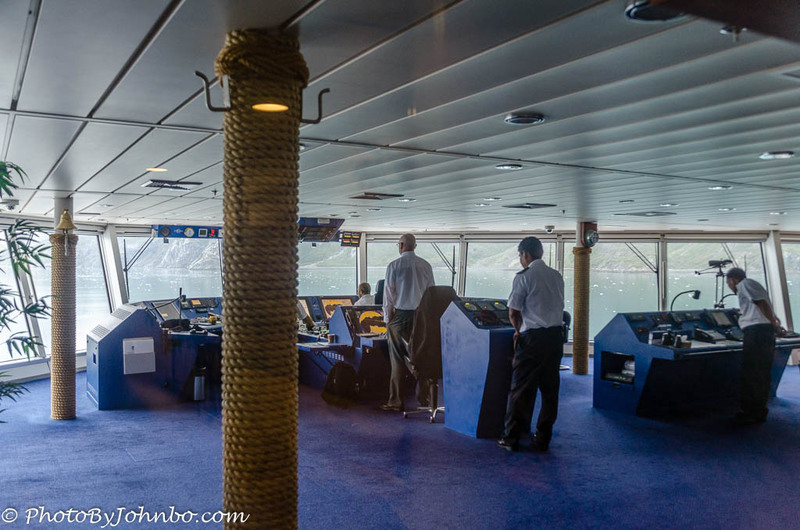 Through glass windows, you can watch the crew navigating the ship on the bridge. That’s a spectacular Glacier Bay view out the expansive front windows of the bridge. We missed this area on our Panama Canal cruise. You will find the bridge at the front of the ship on deck 11, if I recall correctly. In the bridge observation room, there is a large model of the Norwegian Pearl on display. Several monitors display images that mirror the displays on the bridge. 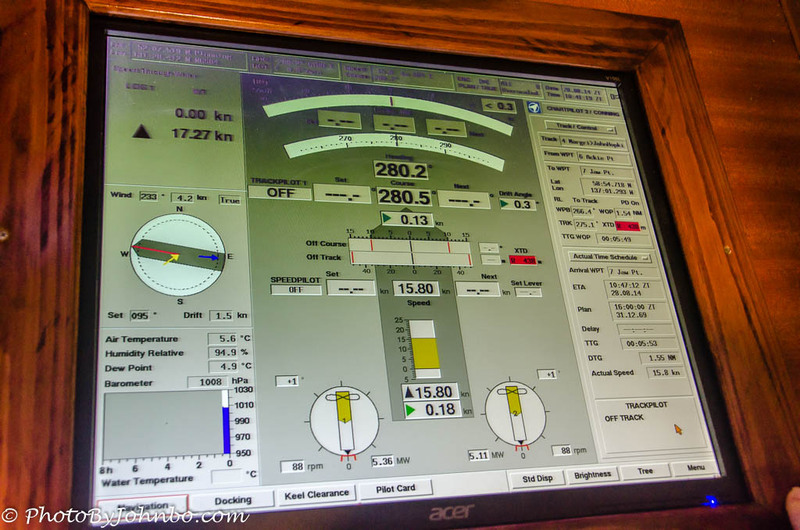 The captain and crew use modern touch screen displays to view ship conditions. The above image is one of the monitors that passengers can view in the observation area. From the outside, the bridge can be seen near the top. It’s the area with the windows slanted inward at the bottom. We are looking forward to our next cruise. We’ve become accustomed to the style of cruising offered at NCL. We know there are other great cruise lines, but a wise man once told me, “If it ain’t broke, don’t fix it.” There is nothing needing fixing in our selection of cruise lines, (unless, of course, our destination isn’t on one of their itineraries.) The gallery of images below features some of the views of the Pearl not featured in my post on the canal cruise linked above. Click on an image to enlarge it and to scroll through the gallery. Wall art is found indoors and out. Views from the deck are always stunning. The Bliss Lounge is a comfortable place to hang out. Our exercise of choice is walking the prominade deck. One of the seating areas in the Bliss. Bowl a few frames on one of the four lanes open for bowling. Maintainance is ongoing even during cruises. Ship control screen viewed from the bridge observation deck. Alaska from the highest deck on the Pearl. It’s cool how much art there is! Looks like a fun time, bet ya’ can’t wait for the next one, and I look forward to reading about it.